Paul Mellon [1907-1999], Upperville, Virginia, by 1966; bequest 1999 to NGA, with life interest to Mrs. Mellon; life interest released 2004. The painting was lent to a 1966 exhibition of the Mellon collection at the NGA. Exposition de Tableaux, Pastels et Dessins par Berthe Morisot, Boussod, Valadon et Cie., Paris, 1892, no. 36. Madame Eugène Manet, Exposition de son oeuvre, Galerie Durand-Ruel, Paris, 1896, no. 14. Cent Oeuvres de Berthe Morisot (1841-1895), Galerie Bernheim-Jeune, Paris, 1919, no. 32. Berthe Morisot 1840[sic]-1895, Wildenstein and Co., Inc., New York, November-December 1936, no. 3. Berthe Morisot, Madame Eugène Manet, M. Knoedler and Co., London, May-June 1936, no. 16. 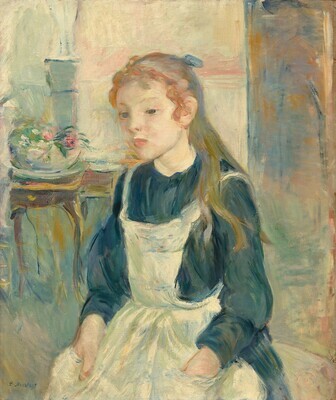 Berthe Morisot (1841-1895), Musée de l'Orangerie, Paris, 1941, no. 85. Exposition de peinture Française de l'impressionnisme a nos jours, Palais Saint-Pierre, Musée de Lyon, 1942, no. 28, as Portrait de Jeune Fille. Berthe Morisot, Galerie André Weill, Paris, 1947. French Paintings from the Collections of Mr. and Mrs. Paul Mellon and Mrs. Mellon Bruce. Twenty-Fifth Anniversary Celebration 1941-1966, National Gallery of Art, Washington, D.C., 1966, no. 96, repro. Fourreau, A. Berthe Morisot. Paris, 1925: pl. 29. Angoulvent, Monique. Berthe Morisot. Paris, 1933(? ): no. 517. Bataille, M.L., and Georges Wildenstein. Berthe Morisot, catalogue des peintures, pastels et aquarelles. Paris, 1961: no. 266, fig. 279. Clair, Alain, Delphine Montalant and Yves Rouart. Berthe Morisot 1841-1895. Catalogue Raisonné de l'oeuvre peint. Translated by Jean-Alice Coyner. Montolivet, 1997: no. 270, repro.